One of my goals is to get rid of stuff. 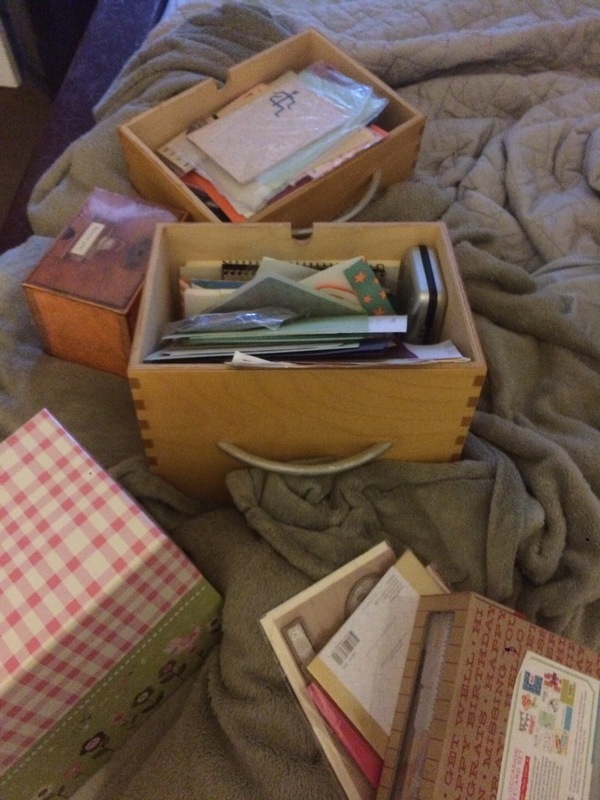 I have boxes of things that have been in boxes for over four years…and I haven’t unpacked it. So my goal is to unpack and/or get rid of seven boxes a week. Which averages 1 box a day. If I remember to take photos, I will include them. About a year ago, my sister was cleaning out her bookshelves and asked me if I wanted any books she was getting rid of. I said “of course,” (because who says no to free books?) and she packed up a box for me to bring back home. I brought it back home, but the box never left my car. Until this week. I opened the box and kept 3 books. The rest (about 10) were re-packed along with a foot tall stack of magazines and donated to the library. While this is part of #8: Get Rid of 100 Things, I only count books and magazines as one item, so it doesn’t matter how many I donate. One of my (many) consumer weaknesses is paper. Post-its, greeting cards, notebooks, scrapbooking supplies….I love to buy these things, especially if they are on the clearance rack or otherwise discounted. Unfortunately, I don’t use them at the same rate as I buy them. In this go around, I had five different containers of paper products…some stickers are as old as 1988! This, strangely enough, was a tough job. I was attached to some of these things…more than I thought I would be. The stickers (I need to add a photo of them) were illustrations of Macross characters by Haruhiko Mikimoto (if you grew up in the 80s and remember Rick Hunter and Lisa Hayes and Minmei, you’ll know what I’m talking about) which I couldn’t let go. I also had handmade cards from a friend, which I probably won’t use. I did a lot of consolidation, but I didn’t get rid of anything. I need to be in a foul mood. When that happens, I’ll get rid of a lot of stuff. These boxes, well, to be continued. I didn’t realize until I took out the first box that I had another box AND a bag. These were easier. The bag were paper Trader Joe’s bags, so I kept them for recycling, and the box was filled with plastic bottles half-filled with water. I used the water for my (one) plant, and recycled all in the box. 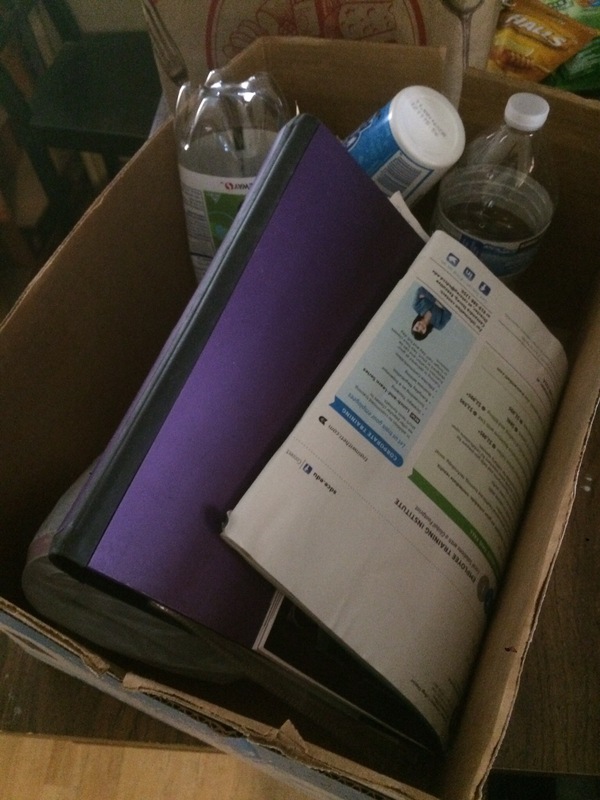 The purple item is a coupon binder filled with coupons that expired over a year ago. This will be repurposed to a household binder )#43 on my list). So I didn’t get through 7 boxes of stuff. But my car is cleaner than it has been in over a year, and I have more surface space on my file cabinet (where those cards were). I need a better go at it. Next week will be better.